I just got too impatient to wait any longer and after several attempts, yes ... this too didn't work the first time, I have opted to use 'html' to upload my photos for now. It takes much longer to do so but at least I can blog properly again!! I had taken some photos of my backyard to share with you again last week after it had snowed in the night and of course the squirrels were there again too and I was so smitten. For a short while there were about 6 or 7 in my maple tree at once. This winter my Peter Pan stayed outside to experience the wonder of snow. These little critters are so beautiful! 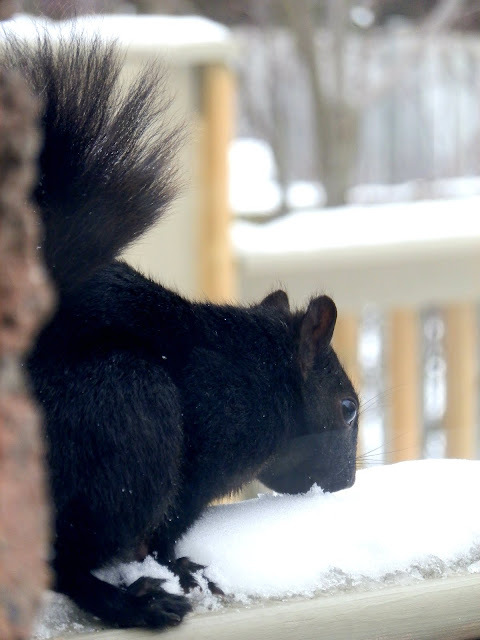 This black squirrel sat just outside my kitchen window and ate some snow to quench it's thirst away and sat just long enough so I could capture it to share with you. Nature is something so precious we should all treasure! It would be nice if you come back soon and see what I've been up to. I've never seen a black squirrel.. he's a beauty. We finally had to stop putting out seed for the birds.. the squirrels were eating them like crazy. We were getting about 10 routinely. I do love to watch their antics when they're at play. They're still around, just not in such big numbers in our back yard any more. Glad you got things sorted so you can post pictures. I've never seen a black squirrel..
PS been seeing some of your wonderful creations around on Pinterest, and on FB. Been adding a link to your site on some, as they did not give source. What lovely winter photos and the squirrels are cute and how exciting to see a black one. We have little grey ones down here in s.e. FL. I use Windows Live Writer to write my blog posts and really enjoy it. You might want to look into it. Originally from Ottawa, Ontario, but have been on Vancouver Island for close to 20 years. No squirrels out here - and really miss the little critters. Thanks.